Some time ago, I reviewed a nice set of grilling tools from Cave Tools. 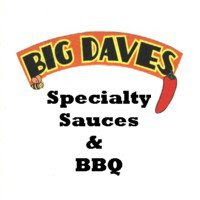 Since that time, Cave Tools has expanded their product line to include a wide variety of BBQ and cooking tools and accessories. When Cave Tools approached me about reviewing more products, I zeroed in on their instant read digital thermometer. Despite several years of immersion in the BBQ world, I have never used a meat thermometer while smoking Q. It had almost become a point of pride. In my arrogance, I thought "I'll know when it's done". In reality, many costly mishaps could have been prevented over the years had I simply used a digital thermometer. Even though I've had the thermometer for several weeks with every intention of using it for the review, I've still been oddly reluctant to use it. I did, however, finally have an occasion to use it over the Independence Day weekend. I smoked a whole brisket for a family picnic and Cave Tools' thermometer was a key element of the meal's success. The stainless steel needle is roughly six inches long. This is ideal for large cuts of meat like brisket as the temperature needs to be taken as close to the center as possible. The device was incredibly easy to use. I simply turned it on and inserted the needle into the thickest portion of the brisket. Within a few seconds, I had an instant, accurate reading. I needed to repeat the process two more times before I hit my target of 165 degrees. Cave Tools products have the reputation of being durable and this little device is no exception. The stainless steel is durable and won't rust. The head is water and shatter proof. If necessary, you can even re-calibrate it to ensure long term accuracy. This thing is built to last. Digital thermometers are simple trinkets, with a sole purpose. After using Cave Tools' thermometer, I'll never take them for granted again. While I still hesitate to say they're essential for turning out great BBQ, they sure make it a LOT easier. Cave Tools has come a long way since the first time I reviewed one of their products. Check out the new (to me) website. It looks great and has plenty of helpful information about this thermometer and all of their fine products. Below are direct links to purchase this thermometer. 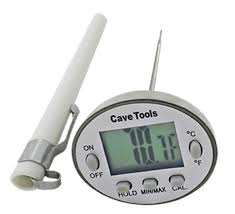 4 Response to "Cave Tools Instant Read Digital Thermometer"